Done well, hoardings play a key role in engaging, informing and exciting passers-by. Real stand-out hoardings can focus attention on a site earmarked for a new store or visitor attraction, driving curiosity, and helping to build an interested customer / visitor base, ahead of opening. (1) This hoarding, along the side of the old ice rink, might just be our favourite. The vibrant colour palette contrasts nicely against the grey background and draws the eye from afar. 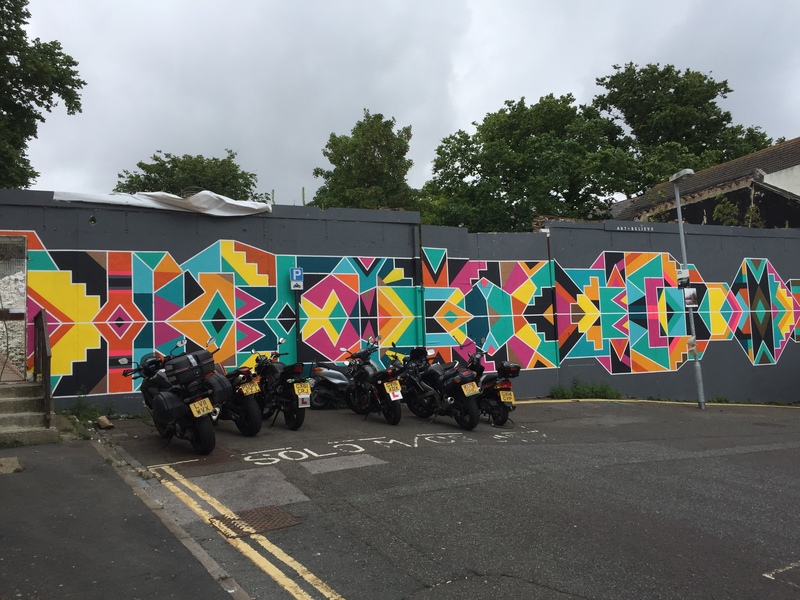 It demonstrates hoardings’ role in the city as a blank canvas on which to host urban street art. 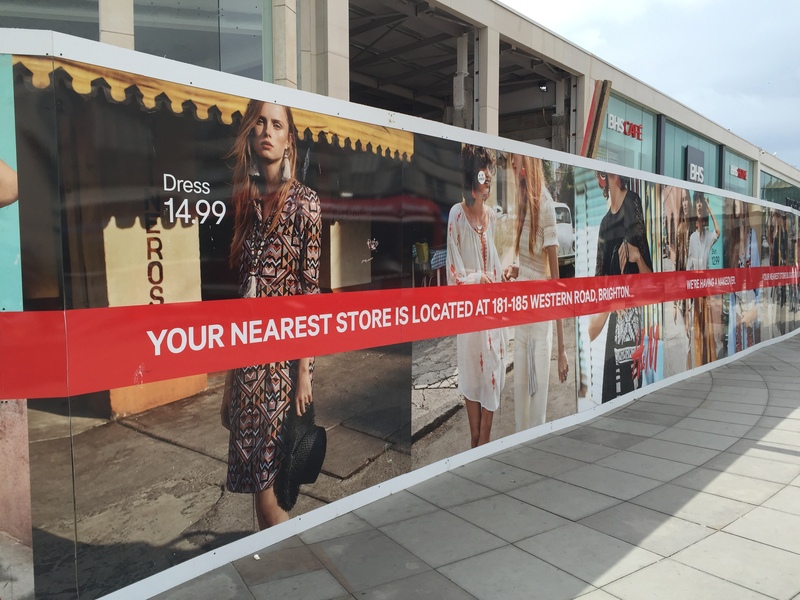 (2) Clothing retailer H&M is using its hoardings as a high-gloss advertising space in Brighton’s Churchill Square Shopping Centre. Messaging also redirects would-be customers to the other nearest H&M store, which should go some way towards mitigating lost sales whilst this store is closed. 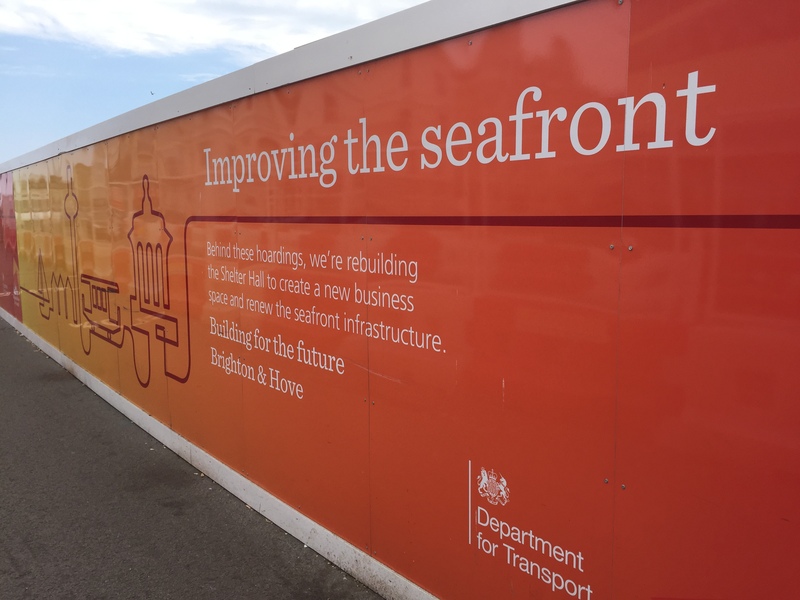 (3) The primary aim of messaging on this hoarding is to inform local residents and members of the public about the work that is being carried out behind, on Brighton’s seafront. The messaging is simple and is clear in explaining the benefit of the works to the public – effectively, the pay-off for putting up with the view of the sea being blocked. 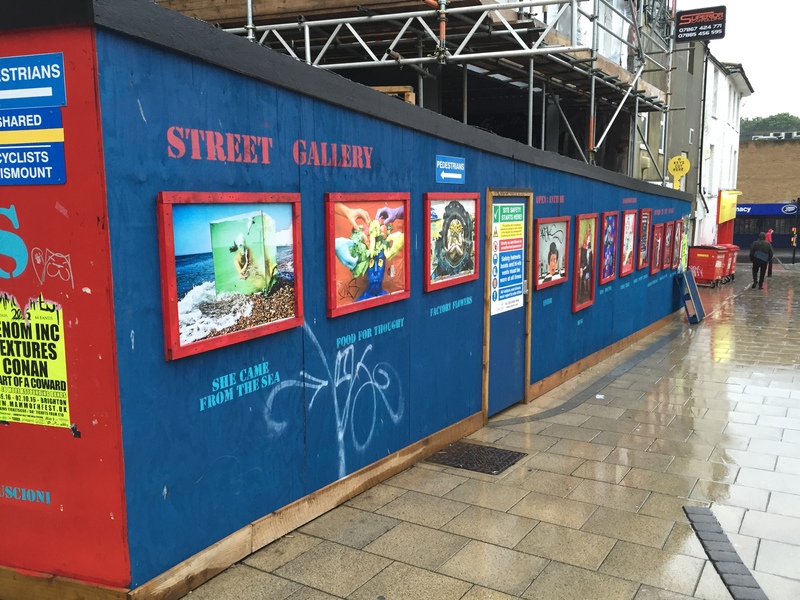 (4) Finished to a more ‘rough & ready’ spec, this street gallery, located in a high footfall area, is simple but effective. Framing the artwork makes the concept even more realistic as a gallery. 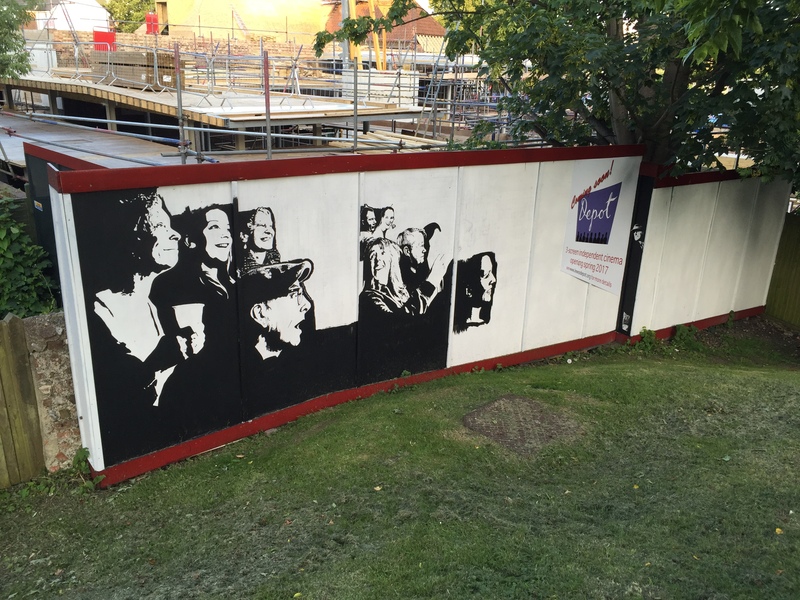 (5) The hoarding outside the soon-to-open new Depot cinema in Lewes, East Sussex, uses striking black and white imagery, with characters gradually being added, thus helping to keep the interest of passers-by. 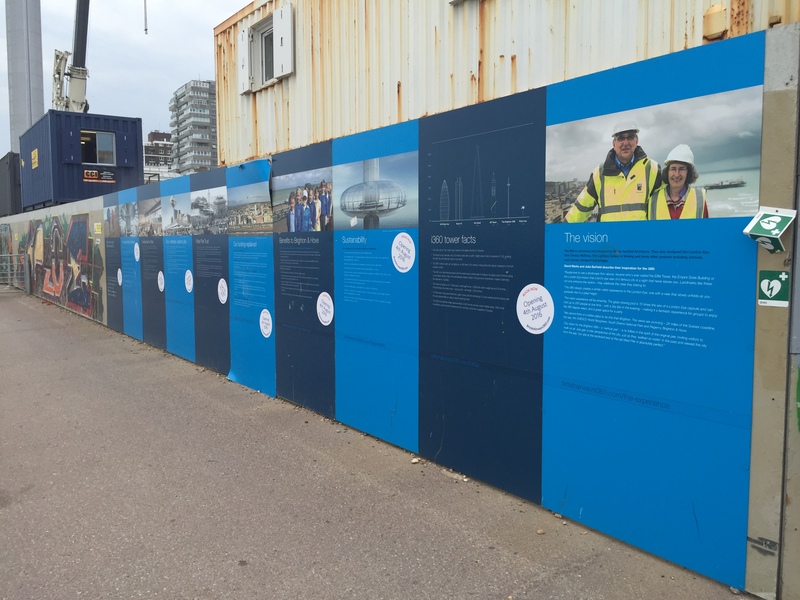 (6) This hoarding outside of Brighton’s soon-to-open BA i360 viewing tower explains in detail the plans for the site, accompanied by relevant facts and high-resolution photography. The blue colour palette gives a nod to the sea and sky, thus forging an immediate connection between the tower and its natural surroundings. 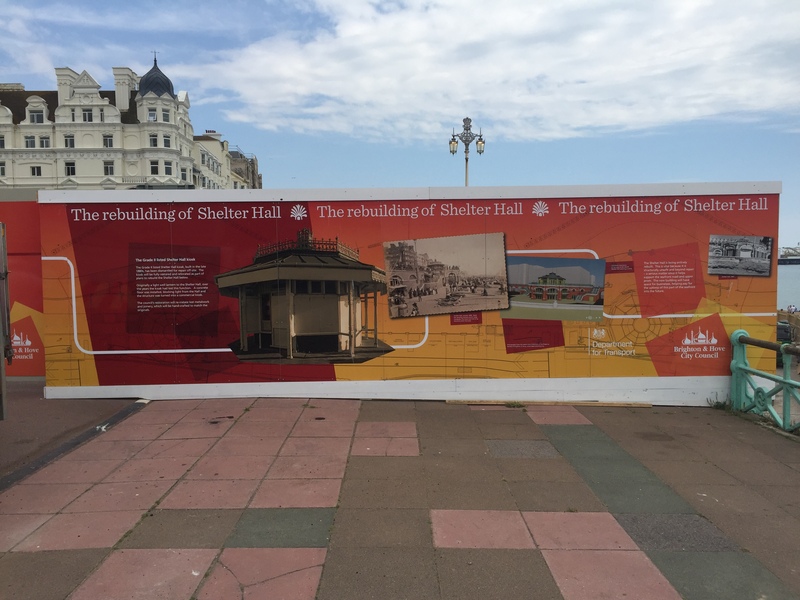 (7) Using a blend of photographs, architects’ images and old maps, this hoarding uses the opportunity to engage with the public over Shelter Hall, a point of local history and the subject of a restoration project. In these days of local authority budget cuts, it is an inexpensive way in which the Council can promote its role as a restorer of pubic buildings.